This is my third post in a series on Enterprise Software. In part one I covered the need for early-stage enterprise software companies to build up professional services staff to ensure successful implementation projects. This goes against the conventional wisdom of VCs. In part two I talked about how to ensure that your professional services practice doesn’t take over your software company although I’m on record that there is nothing wrong with a services company as long as you’re not VC backed. This post is about how to work with your largest customers when you’re an early-stage software company and about how you can increase your margins by selling your roadmap. For starters as a young enterprise software company you need to think about the customer segments you serve. One way of slicing customer segments is by size. I have a metaphor for this that I use with startups called “Elephant, Deer & Rabbits” in which I encourage most startups to be deer hunters. The analogy is that Elephants are a lot of meat but overwhelm your company. You end up bending too many of your R&D (and other) resources to serve them and you end up acting like an internal R&D department. And even then you’ll struggle to serve them properly. Rabbits are plentiful. You see them everywhere so you mistake them for being easy to catch but when you try to grab a bunch quickly (they look so close!) they run fast and even if you did catch them you wouldn’t get much meat. That’s why I like deer. Easy to catch. Lots of meat. And right-sized to serve as a customer base since they might need you as much as you need them. They’re not overwhelming. When you do manage to land a few larger customers (elephants) you need to provide high-quality service, which is one of the reasons in my first post I outline the need for an in-house professional services organization. At my first startup we realized we couldn’t handle too many high maintenance ones so we had to be selective in whom we would serve. We also realized that they were going to consume a lot of resources and have a lot of requests to customize our product so we had to be careful which features we would commit to them. I learned early on that what some of the larger clients wanted was to feel like they could have influence over our organization. They were seeking an asymmetric relationship in which they would be important enough to us to get what they wanted out of us in a way that they couldn’t get if they worked with, say, SAP. So we tried to use this to our advantage. We created a “platinum customer” insider list in which we granted very few customers access. This group was given access to our R&D wiki so they could monitor what we were producing and what we were planning. We held semi-annual platinum customer retreats in which they got to participate in all-day planning seminars with our product team and technical leads. I would personally attend the summary sessions to hear directly what their major requests were. In many ways this was a benefit to us because our teams got direct insight into how our largest customers were using our products and more importantly what our currently solutions couldn’t solve for them. We were able to build deeper relationships with our largest customers through this process – mostly with the people responsible for the implementation success. Importantly we were also able to use the “platinum customer club” as a sales tool as we were trying to land larger accounts. For buyers who want a more hands-on approach some of the key buyer values are access and leverage. I can tell you from experience that they also value the networking that they get with their peer groups and we marketed this heavily. As we were deep in the sales process with the larger accounts we would offer them access to the platinum club as a way to hold the line on price negotiations. Conversely if we needed to give in on our price negotiations to win a deal that centered too much on price we were able to say we would drop their access to the platinum club but give them a better deal on price. Value-based buyers preferred this. I know most technical and product people hate the idea of having to haggle with customers, but it’s a fact of life on enterprise accounts as I talked about in my post “Everybody Wants Their Pound of Flesh.” In fact, if you’re somebody that feels uncomfortable with negotiations I’ve written a series on negotiation topics here. When working with our platinum customers we let them have insights into our planned roadmap and also let them have their vote on what was important to them. We did our best to meet as many customer requirements as we could while also making sure that it didn’t take over our entire development effort. If your largest customers dictate your entire roadmap then you’ll never do anything strategic – you become their R&D department. That’s a real risk so you have to manage expectations carefully. When we published our roadmap to our platinum customers we would inevitably get some complaints that some features were coming too many quarters out and they preferred them done sooner. There was an easy solution to meet their requirements and our own. We would allow them to accelerate some Q3/Q4 initiatives to Q1/Q2 if they would fund the development. Often 2-3 customers would band together to fund an accelerated plan. Before you think it, this was not prostitution. These were always features we knew we needed to build anyways – we were just willing to accelerate / prioritize them. We would staff projects accordingly either by hiring an extra engineer early (one we had planned later in the year) or by using contractors to supplement some non-core coding. It was a win for all parties. We got accelerated development of high-priority projects and we got needed, high-margin revenue by selling our roadmap. Our customers got access, a network, influence and an accelerated timetable to get features that would help their business earlier than we could have developed them without the additional cashflow. I know this is a sensitive topic, one that some will wince at. The idea of selling your roadmap. But on your journey to building a successful enterprise startup don’t imagine that every other successful enterprise startup is Howard Roark pure. I worked inside one of the largest and most successful enterprise startups in the world and I can tell you that nearly an entire release of our code was dedicated to one major financial services customers. Oh yeah? But I still don’t get it? 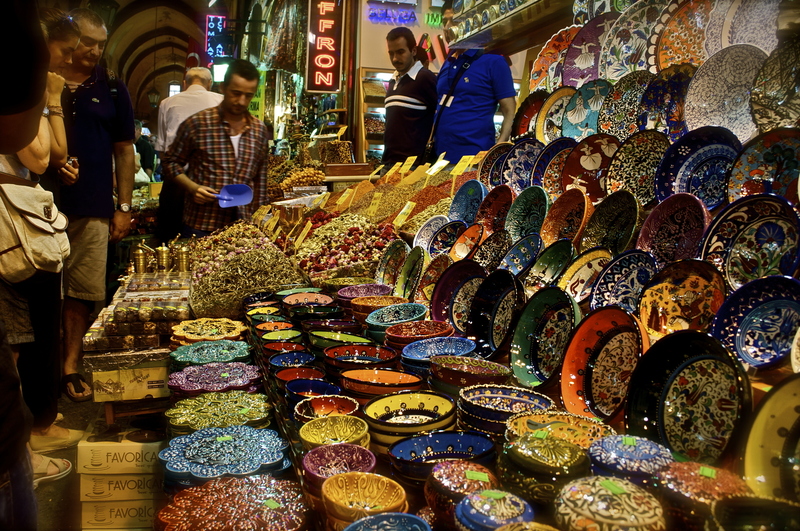 What’s with that image of an Egyptian Bazaar?